EEA’s Ken Wu alongside The Wolly Giant! This bigleaf maple ranks as the ninth widest on the Big Tree Registry with a diameter of 2.29m or 7’6″. It also may very well have the longest horizontal branch of any tree in BC, measuring 23.1m (76ft) long! Conservationists in B.C. have located, what they say could be, the most magnificent and awe-inspiring old-growth forest in the country on Vancouver Island. 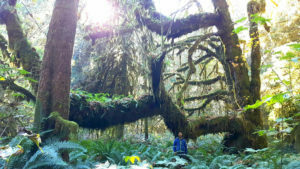 Ken Wu, executive director with Endangered Ecosystems Alliance says the grove consists of giant, prehistoric-looking, shaggy bigleaf maples with tall, straight Sitka spruce, and it was found near Port Renfrew. Wu says the push is on to get the grove, which conservationists are calling “Mossome Grove”, which is short for “Mossy and Awesome”, protected. To do that, Wu is asking people to contact their MLA or make a request through the Ancient Forest Alliance website. The BC government is developing a new set of policies to manage BC’s old-growth forests but have not revealed any details yet. *Note: Mossome Grove stands on Crown lands in the operating area of BC Timber Sales, with some (3-4 hectares) protected in an Old-Growth Management Area and riparian reserve, a portion (3-4 hectares) unprotected within a Woodlot Licence allocated to a forestry company, and the rest is unprotected, falling under the regulatory authority of BC Timber Sales. There are no logging plans for the grove at this time.